So the Toronto TD Jazz Festival kicks off in a couple of days and us over at JazzFeast are starting to get excited. For those who don’t know there are 2 of us writing here and there will be another list of things to see tomorrow. But for now here are 3 that I will not be missing. Wow, what can really be said. 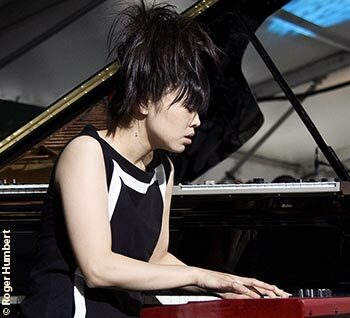 Hiromi Uehara is a musical dynamo, who takes composition in the most serious of ways. I find that her music threads a very fine line between classic composition and jazz but when it’s all said and done she is playing on a field almost unmatched by any of her contemporaries. On her latest album Voice (2011) she is joined by bassist Anthony Jackson and drummer Simon Phillips. This album is jammed with seam filled transitions, which make for an exciting jumpy listen. Simon Phillips plays a rock kick, with a double bass drums to boot, and really pushes this music to a fusion-y plane. Hiromi and her accompaniment have this phenomenal penchant for taking whatever has come before them, whether it be classic composition, hard-bop, swing, or fusion and mold them into a sound that respects the past while quietly stepping on its throat. What I mean by that is they do it all so very well, every element of their music is finely tuned and fully conceived that it really takes from the past and pushes forth into new dimensions of dusty genres. This can all be attributed to talent. I don’t hear that Hiromi is really doing things with her compositions that haven’t been done before, she is just able to exploit phenomenal melodies, harmonies, and runs because she is so damn talented. I had never heard of Roy Hargrove before the Toronto TD Jazz Festival lineup announcement – being a jazz peasant and all – but the more i listen to Distraction (2006) the more i understand. The RH factor, only one of Roy Hargrove’s many projects is a salad of soul, jazz, and R&B, all served up on a bed of funk. Roy Hargrove has seemingly done it all, afro-cuban, afro-beat, hip-hop collaborations etc. He has always pushed his trumpet and songwriting out and into the spectrum of other genres, taking them along for the ride. He has to be acknowledged as the road map purveyor for musicians like Esperanza Spalding and Robert Glasper. The HR factor ensemble has a great laid back vibe, playing with a sense of smoothness that just makes you fall into the groove. If you want to be entranced, to the point of uncontrollable hip swiveling and head boppin’ then you need to experience the RH factor. Kneebody met in the late 1990’s and in my mind have made some phenominal music. Their latest studio album You can have your moment is something i find myself going back to about once every 2 weeks. This has been going on for 3 months now. I guess i’m under the spell. What i love about kneebody is the accessibility of the compositions. There are some complicated things going on but any rock fan will find something enjoyable in the music. Anyways, come and check this show out … it’s gonna be killer. This entry was posted in albums, art, jazz, Live, song, TDJazz, toronto shows and tagged festival, hiromi, Hiromi trio, jazz, june, kneebody, music, nathan phillips square, rivoli, roy hargrove, roy hargrove's RH factor, TD, toronto, toronto jazz festival. Bookmark the permalink.